What if there was a time when Peter Pan wasn't evil, when he was the way every fairy tale book portrayed him? I wouldn't be lying when I said there was. In Maine there is a small town known as Storybooke. You may think you know everything about it, and everyone in it. But I can guarantee you there is one you have not met. 18 year old Haven, was once a girl who never grew up, in a land that is every child's imagination. She's always been an orphan, that was until Snow and Emma took her in. She always refused to tell anyone about her past. And that was only because it involves the one and only Peter Pan. What happens when she joins Emma to find Henry at Neverland? Clarissa Wendy Jones or what her adoptive name is Clarissa Jessica Mills is Henry's big sister that is determine to get home and away from Neverland. Peter wants her to stay so Neverland could have its new queen and he wants her to believe again. But Pan's legands says he will fall in love with the daughter of Queen Alice of wonderland. Is she Queen Alice's daughter? What happens when Clarissa finds the truth? Will she trust Pan or the Dark one to save her? I DO NOT OWN THE ONCE UPON A TIME! I ONLY OWN CLARY AND THE PLOT! Arabella and her three sisters have been on their own for nearly five years. Using their special abilities, they get by unnoticed, but things change when a new boy appears at their school. He brings back not only memories from the girls' past, but may hold the key to the answers they never had, and the secrets of a paradise in ruins. Haley is a girl who tries hard to fit in. Its hard to fit in when don't have any friends and everyones afraid of you because your dads in prison. Haley just wants her life to end. She feels alone, lost even. One night before she went to bed she saw a figure at her window. She opened her window and say a dark shadow with green eyes. The shadow held out its hand she took it without thinking and off she went. Peter Pan is a selfish, unable to love and heartless. One day a shadow brings a girl to his island. He wants nothing to do with her. One night he starts to talk to her. What happens when he starts to fall for her. Will he be able to love her or will he go back to his selfish ways? Will they be able to put aside their past and start a new future together? 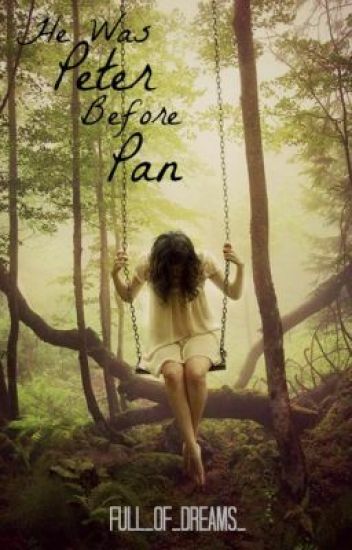 Sequel to "He was Peter Before Pan"  Haven, the girl we all know. The girl who lived in Neverland, who was Peter's "Lost girl", and the only person he ever loved. But that was years ago. Now Peter's changed, now he's "Pan", he's evil. What he and Haven once had has been lost forever, Pan no longer loves. Love makes you weak, and he will never fall in love again. Or so he promised. Haven's back in Neverland, her goal in the beginning was to get Henry and get out, but we all know her plans never work out the way she wants them to. Her friends have turned to enemies and she can no longer trust anyone. Her "family" were the ones to put a dagger to her throat, and poison her with dreamshade. The only hope she has of survival in the one and only Peter Pan. But can he save her? "If I'm Going Down, You're Coming With Me." "Once you set foot in Neverland, you can never leave. And you can't win it." Meg is the daughter of Captain Hook and the famous Emma "the savior." From the day she was born, she was shielded from magic, which was hard for her parents considering she was living in a magic town named Storybrooke. When the day comes along when Meg finds out about magic, she runs away to Neverland where she meets the very handsome Peter Pan. Will Meg look passed his past and give the mysterious boy a chance? Or will Pan just be a chapter in her life's story that she wants to forget?